A small kitchen in these North Myrtle Beach vacation rentals is furnished with dishes and cookware so if you want to make a meal during your stay at Chateau Manor you can do so. The kitchens all feature a refrigerator, stove/oven and microwave. Some of the North Myrtle Beach condo rentals at Chateau Manor have a dishwasher for your convenience. The kitchen is a nice amenity at your Chateau Manor North Myrtle Beach condominium because you can keep your drinks nice and cold and reheat leftovers from the fabulous meal the night before. Making popcorn and preparing snacks and breakfasts during your North Myrtle Beach vacation at Chateau Manor is a pleasure when the beach is your backdrop and a world of fascinating amusements and attractions awaits you right outside. The living room in each of these North Myrtle Beach condominium rentals has beautiful views. The sliding glass door lets in so much sunlight so that the entire space is dripping with natural light. Watch a movie in the living room as there is a DVD player provided for you in each one of the North Myrtle Beach vacation units at Chateau Manor. Relaxation comes easily in these surroundings. Step onto the private balcony and breathe in the sea air. Listen to the waves as they come crashing to shore and watch the beaches fill with families and walkers. Count the number of boats that are just offshore and keep your eyes open for pelicans that hover over the ocean searching for fish. Sometimes you can see dolphins swim past your North Myrtle Beach vacation rental but you have to be quick with the camera to get a photograph of this beautiful sight. 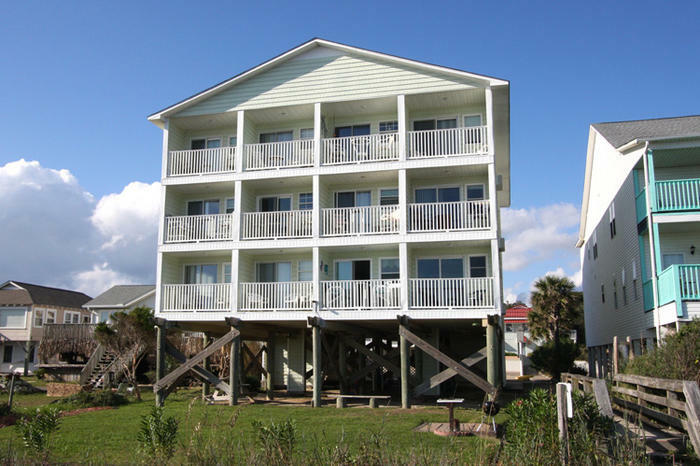 Nearby the North Myrtle Beach resort of Chateau Manor, that features non-smoking vacation rentals and an on-site grill area, are Myrtle Beach golf courses, seafood restaurants, water sports and live entertainment theatres. Enjoying an Ocean Drive location for your North Myrtle Beach vacation comes with plenty of perks. One such perk is the proximity you will enjoy to everything else around North Myrtle Beach, South Carolina. There are more than 100 golf courses in the Myrtle Beach area. Bring your golf clubs and enjoy the natural beauty and the challenging holes that are featured on some of our award-winning golf courses. Making a tee time is easy and finding the Myrtle Beach golf courses is a breeze. In the Myrtle Beach area you could count more than 1,500 restaurants. Choosing which ones to visit might be difficult with so many options at your fingertips. While seafood is almost everywhere those who prefer sizzling steaks, juicy hamburgers and healthy salads will still find plenty of choices on the menus of nearby restaurants. Some adventurous water sports are closely located to Chateau Manor. You can go parasailing and marvel at the views of the ocean and beachfront while being towed behind a speed boat. Some places even offer tandem parasailing so two people can go at one time. Now that is a North Myrtle Beach vacation memory. Sea Doo rentals are popular water sports and there are places where you can ride in the Atlantic Ocean and also on the Intracoastal Waterway. Take the whole family on a banana boat ride and bounce over the waves as a Sea Doo tows you up and down the coastline. There are more tranquil water sports for those who want to stay relaxed. Try a guided kayak tour in the salt marsh or ride horseback on the white sandy beaches. Doesn’t all of this sound just grand? It is all available for you when your North Myrtle Beach vacation brings you to the Chateau Manor in the Ocean Drive section of town.